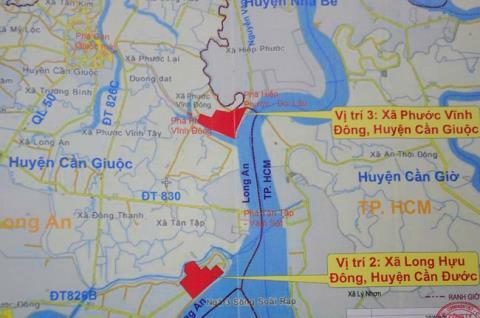 VietNamNet Bridge - The Ministry of Industry and Trade (MOIT) is consulting with Long An and HCMC local authorities about the location for the Long An Power Center, which HCM City opposes. The representative from Long An provincial People’s Committee, at a recent meeting with MOIT, said Phuoc Vinh Dong commune in Can Giuoc district is the best choice for the center. The opinion has received sympathy from MOIT, the Ministry of Transport and General Directorate of Energy. However, the HCMC People’s Committee has expressed its disagreement about the plan. Besides, the existence of a thermopower plant on the right bank of Soai Rap River, just next to HCMC, is feared to cause pollution to the city. Le Huy Ba, former head of the Institute of HCMC Industry University’s Science, Technology and Environmental Management, said HCMC authorities have every reason to worry about this. Ba said the risks of pollution always exist in every thermopower plant. China is now rethinking its strategy on thermal power development because of high pollution levels. Vietnam has been warned that it would be one of the most polluted countries, just after China. If it continues developing thermalpower plants, the danger would be more visible. Meanwhile, Japan, though having modern technology, now focuses on developing clean renewable energy. Ba agrees that it is necessary to thoroughly consider the plan to set up a thermal power plant in the area close to HCMC. “The area is very near to HCMC. If the southeasterly wind blows, all the smoke and dust of the plant in Long An province will be brought to the districts 7, 8, 5 and the central area of HCMC,” he warned. “Under the plan to develop thermal power in Mekong Delta, there would be power plants in every province. If there is one more plant in the Long An – HCMC area, the consequences would be serious,” he said. “The pollution level in Vietnam may be even higher than China,” he warned, adding that Vietnam needs to be very cautious with the thermal power development. Sharing the same view, Phung Chi Sy, deputy director of the Institute of Tropical Technology and Environmental Protection, said though thermopower plants are usually put in coastal areas, the risks to the environment still exist. Though Vinh Tan 2 and Vinh Tan 4 Plants are put under strict control, locals still complain about dust from them. Ba raised a question about the technology to be used at the new plant in Long An province. He warned that if Chinese technology is applied, the risk would be very high.